U.S. Army veteran and Chicago Campus student Ashley Tisch believes strongly in serving both her country and her community. This belief led her to volunteer with military children after leaving the Army, providing her the opportunity to give back, and eventually leading to recognition from national coalition of colleges and universities, Campus Compact. The M.A. in Counseling Psychology student was named one of the organization’s 2017 Newman Civic Fellows. The fellowship was specifically developed to recognize community-committed students. Ashley volunteers with Kids Rank, an organization that provides military children with a sense of stability through interactive group learning experiences. Having seen firsthand the struggles military families face, Ashley felt compelled to serve these families. “Military children are such a vital part of their family dynamic, yet they are often forgotten, and left coping with transitions and losses alone. 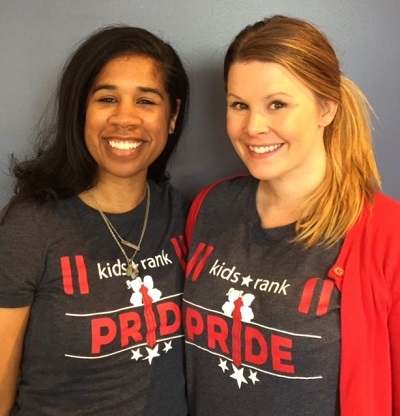 I wanted to be a reliable and supportive person for these kids.” A Kids Rank pride leader and program coordinator, Ashley facilitates meetings and develops program curriculum that takes a strengths-based approach and promotes character building. A second honor was bestowed upon Ashley by Mission Continues, an organization that seeks to help veterans find purpose through community impact. As a Mission Continues fellow, she was able to commit 20 hours per week to a local nonprofit and gain experience and networking opportunities that she has found helpful in her professional development. Pictured above: Kids Rank founder Kelcey Liverpool (left) and Ashley Tisch.